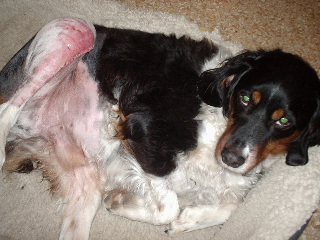 Here’s the poor post-op dog. There are so many staples in that leg that it looks like he’s got a zipper — he’s not really putting weight on it yet although he’s toe-touching a lot. He also seems to think that when in motion, it’s important to go everywhere as fast as he can on his three legs — I think he’s trying to outrun the leg that hurts — but it keeps following him around. He’s in pretty good spirits — bored, and occasionally making a run for it, or doing something he shouldn’t like jumping on the couch (he’s allowed on the couch, it’s just the jumping on and off while on the injured list that has me worried). There are two kinds of canine ACL surgery — we went for the less-invasive one where they drill a hole through his lower leg bones, and string a suture through it, then wrap it around the back of the joint to stabilize it. There’s another more radical surgery where they actually cut off the lower leg bones, change the angle of the knee joint, and bolt it all back together — but that seemed a little severe, and since he’s not a big dog, we went for the less-invasive option. The good news was that the ligament hadn’t been entirely blown, so the recovery should be easier that it would be otherwise. Right now he’s in his crate in my office, a crate he likes much better today than yesterday, because I folded up a big poofy old comforter and so now it’s very cozy in there. There’s a lot of sleeping going on around the casa, and his incision is looking better every day. Poor bunny. Here’s hoping he’ll be able to run and chase things through the woods again this summer like his old self. Oh, poor guy… he’s even doing the pouty face in the picture! I’ve heard that the canine ACL surgery usually has very good results, so I guess it’ll all be worth it. It’s just no fun to see your dog in pain when they don’t understand why.